Royal Club Manager of Competitions, Colin Hamilton, not only organises the main events, but he usually plays in them too. And wins them. Today at Stranraer, with Sean Murphy, he captured the National Pairs title, for the third time, following previous success with Vic Moran in 1989 and Trevor Dodds in 1991. Find all the results here. "For the past five years one of the highlights of the curling year in Edinburgh has been the International Curlers Gathering organised by Colin McCall and the Penicuik Curling Club. This year’s competition was no exception and curlers travelled to the event from Canada, St Petersburg in Russia, Switzerland, Sweden, Denmark, Spain, Slovakia and Germany. There were eleven foreign teams in total, the other seventeen teams being Scottish. All the teams were asked to identify themselves. Some did so in traditional style – thus the Musketeers and Merchiston; others tried a mix of the old and the new, for example the Inverkeithing Royals; then there was the plain eccentric – the B-52’s, Medved, the Corrie Fisters, Puigcerda and the unpronouncable AnderChristalwake! The Musketeers (Hamish Lorrain-Smith, Alan Chalmers, Struan Macnee and John Munro) successfully defended their title. This competition is about much more than winning and losing; it really is a celebration of curling and the making and renewing of curling friendships. A successful ceilidh was enjoyed by many of the competitors on the Saturday night. The rink was filled to bursting throughout the weekend and even the prizegiving ceremony – traditionally attended these days by one man and his dog – was a celebration of the event with the upstairs bar at Murrayfield filled to capacity. The ceremony was chaired by Colin McCall and the prizes were presented by the Rt Hon George Grubb, Lord Provost of the City of Edinburgh." 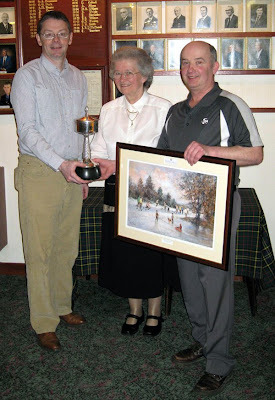 Top: Janet McMillan presents the Pairs trophy to Sean Murphy and Colin Hamilton. Photo courtesy of Gail McMillan. 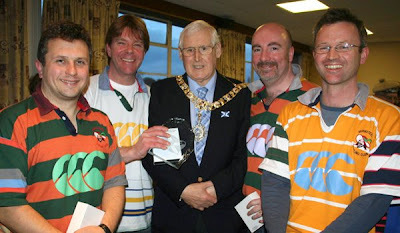 Above: The winning Musketeers with the Lord Provost. L-R: Alan Chalmers, John Munro, Rt Hon George Grubb, Lord Provost of the City of Edinburgh, Hamish Lorrain-Smith and Struan Macnee. Photo courtesy of Robin Copland. "Haggis gets a bad rap"